In 1952, Christy Hariton and Chris Patsalides bought land on Little Creek Road in Norfolk. Their aim was to build the restaurant of their dreams. First on the list was to serve the best steaks possible. This meant buying the best steaks possible. They purchased all meat through Armour, and all purchases were top choice and prime USDA Beef. The restaurant's design included a large, covered drive-up entrance, a large lobby area with room for comfortable chairs, and seating for at least 300. They wanted to have a large kitchen, open to the lobby area, where customers could view all aspects of food preparation. Equally important was creating the ambiance of simple elegance with soft lighting, white linen, and soft music. Of course, excellent service was paramount. A large walk-in aging room for whole sides of beef was a necessity, as well as equipment and space for Christy Hariton to cut and trim all the steaks. In 1954, their mission was complete. Before opening, Chris and Christy had trouble deciding on a name for their restaurant. To solve their problem, they advertised in the Virginian Pilot and Ledger Star. They developed a contest to name the new restaurant. The winner of the contest would receive $500 and dinner for two with all the trimmings. Black Angus won hands down. They then registered the name in the State of Virginia. Chris and Christy prospered at 1890 East Little Creek Road. Their excellent fare, service, and constant effort to please left little to chance. They instituted free hors d'oeuvres consisting of crackers, liver pate, sprats and feta cheese, pickled mushrooms, and marinated asparagus tips, and they served these to every customer. 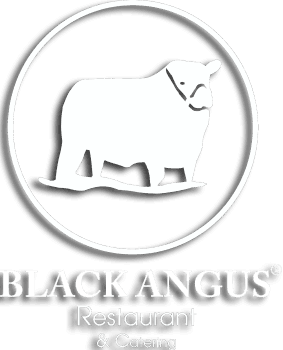 The commitment by the owners, combined with the food and service, propelled the Black Angus to the top. It quickly became 'the' restaurant in the Tidewater area. Special events, holidays, Sundays, and gatherings were all highlighted with dinner at the Black Angus Restaurant. This reputation has lasted through the years. Hotels and motels have been sending their guests to the Black Angus. Taxi drivers have been leaving their fares at the doors of the Black Angus. Brides have had their most elaborate or simple receptions catered by the Black Angus. Businesses have made a point of having their regular and annual meetings at the Black Angus. All with the confidence that the Black Angus will fulfill their every wish for a successful event. In 1960, Christy Hariton and Chris Patsalides joined forces with Andrew Phillips and their nephew Michael Savvides. They wanted to expand their operations to Virginia Beach. They met with Ned Holbrooke, a noted architect of the area, to design the beach property. In keeping with the beach area, they wanted a more casual atmosphere, but still wanted to retain the Black Angus's elegance. Holbrooke came through with a very workable plan. This Black Angus retained the open kitchen that had been a specialty of the Little Creek property. Holbrooke captured the Black Angus elegance with soft lighting, booths, fountains, and a large main dining room that could seat 425 guests. For private parties or special occasions, they could divide the room into three dining rooms. Not only was the dining room on the cutting edge, the kitchen was a model of modern design that maximized production and sanitation. A key change in the Black Angus Restaurant as it expanded into Virginia Beach was the expansion of the menu. New to the menu was a complete seafood section, along with the addition of chicken and pasta. Another dimension was added that has taken off like a rocket. Catering has become a strong part of the Angus success story. The Black Angus has satisfied many. From small intimate parties, weddings, business meetings, and box lunches to serving 35,000 guests at the commissioning of USS John C. Stennis and USS Harry S. Truman, the Black Angus has proven itself more than capable of handling your catering needs. In 1974, the Black Angus at Little Creek closed its doors and Christy Hariton sold his interest in the restaurant operation to Michael Savvides. Andrew Phillips and Chris Patsalides unfortunately passed away. Michael Savvides continued the Black Angus tradition and successfully operated the restaurant for 25 years at the Pacific Avenue property. In 1986, he then moved from 33rd and Pacific to 7th and Atlantic Avenue. In 1992, Michael's son Christopher officially took over the operation of the Black Angus. With the help of Chef Spiros Boubas and long-time manager Francis Quinn, Christopher continues to operate the restaurant. Michael is still active with and participates in the daily operations with Christopher. They continue to operate to this day and look forward to another 50 years of operation.